On the cover: Bark stripped tree photo by Emily Gurnon. Maxine, one of the resident black bears of the Sequoia Park Zoo, poses for the cover. 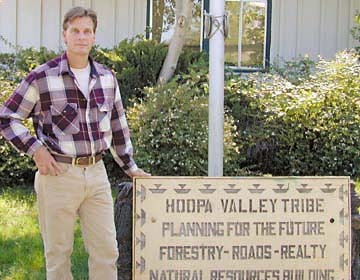 Mark Higley [photo at right] was a 30-year-old Humboldt State graduate when he started his job as wildlife biologist for the Hoopa Valley tribe's forestry department in 1991. His first day there was like most first days at work: introductions to new co-workers, papers to fill out, directions to the bathroom. Then he met the tribe's silviculturist, or forest scientist, who was not much for small talk that day. "Hi, my name is Paul Abbott," the man said, holding out his hand to Higley. "We have a problem." The tribe had begun seeing a phenomenon it hadn't encountered much before, Abbott told his new colleague. Black bears were coming out of their winter hibernation and dining on the Hupas' bread and butter: the Douglas fir trees whose sales generate about 90 percent of the tribe's income. 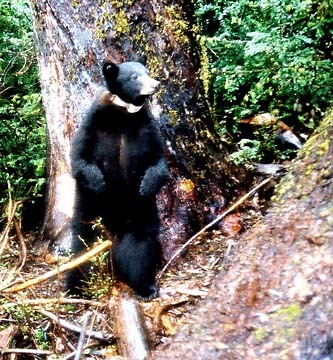 Higley now estimates that the bear damage will cut the tribe's timber revenues by at least $1 million to $2 million a year -- about 15 percent -- within 10 years. Just next door, to the west of the Hoopa reservation, are 100,000 acres of redwoods and Douglas fir trees owned by Green Diamond Resource Co., formerly Simpson Resource Co. It, too, is finding the bears a major headache, as are Pacific Lumber Co. and many smaller foresters. "We've been concerned about it for a long time, and finally got our [company's] resources together to take a hard look at it," said Dan Opalach, timberlands investment manager for Green Diamond. The problem is not exactly new, and it is not limited to California. Timber producers in Oregon and Washington have been struggling with it for decades. Companies here and elsewhere have tried various approaches to stopping it -- from hunting the bears to feeding them. But it's getting worse, Higley said. And there's a reason. "We've converted the habitat," he said. Before large-scale forestry, all the trees grew unimpeded, so that the North Coast was covered in old growth. In recent decades, timber companies have worked on growing trees as quickly as possible to get the most profit. That means pruning and thinning out the weaker trees. Those remaining get more sun and more root space. "The trees that they're maximizing growth on are the ones that the bears love to eat," because they tend to be sweeter, Higley said. "We've made the entire landscape into these fast-growing young stands, and then you wonder why the bears are eating it." Steve Horner agreed. Horner is a silviculturist and manager of sustainable forestry for Pacific Lumber Co. "We're creating salad bars for these bears," he said. 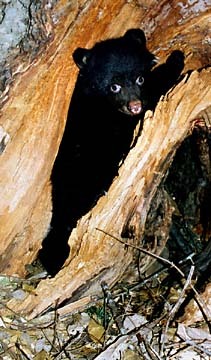 Black bears have historically made their home throughout North America, and are still present in at least 40 of the 50 states, according to the Web site of the U.S. Department of the Interior, National Biological Service. 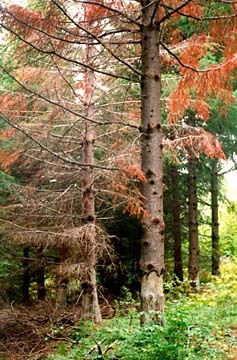 Scientists have noted the tree-stripping behavior since as far back as the turn of the 20th century, Higley said. And in Humboldt County, foresters have seen it for decades, although the bears themselves seemed much more scarce in bygone days. "I've talked to a lot of old-timers [who were loggers] about bears," said Horner. "Back in the `30s and `40s, it was very rare for anybody to see a bear. If they were to see a bear, it was a big deal." 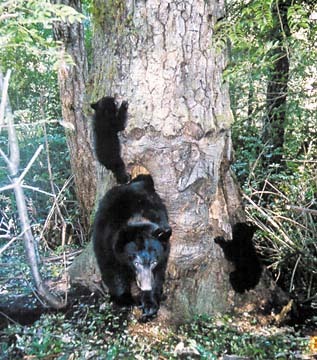 Today, foresters say, it's not unusual to see two or three bears a day. Numbers from the state Department of Fish and Game confirm that the black bear population is rising; today the department estimates there are at least 25,000 to 30,000 black bears in California. About half of those live in the region north and west of the Sierra Nevada mountains, including the North Coast, and ours is the region with the greatest number of bears per square mile. Though they may have kept out of sight, the bears of earlier days nevertheless made their presence known. 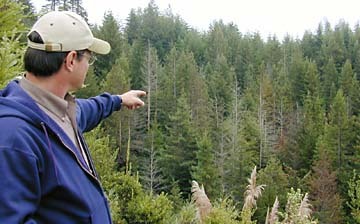 Beginning in the late 1940s, the Hammond Lumber Co. had enough stripped trees that it began to do surveys of bear damage on its property, said Jim Able, a private forestry consultant who has worked on the North Coast for 35 years, starting with Georgia-Pacific, which had by that time bought Hammond. 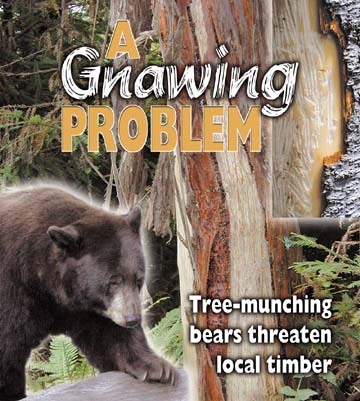 Researchers have found that the tree-stripping behavior occurs in the spring, when the bears emerge hungry from their winter torpor, and their main sources of food, such as berries and acorns, are in short supply. It is a learned behavior, usually taught from mother to cub, but not all bears do it. The ones who do may sample a number of trees, stripping off a piece of bark and scraping their teeth over the sweet cambium layer underneath, before they find one they really like. The tastiest trees may be completely denuded. The effect on the tree can be catastrophic. 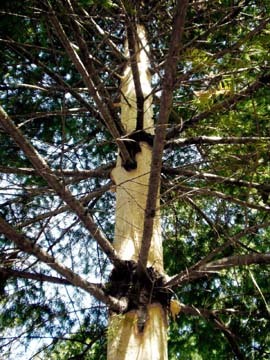 A missing piece of bark opens the tree to infestation, disease and rot. A tree that is stripped all the way around in one place, or girdled, will die, because the sap cannot travel up the trunk. 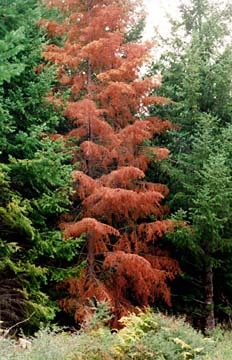 "Driving along [Highway] 299, if you look out, you can see a bunch of red trees," Horner said. "Those are the trees that have died after being girdled by a bear." The ones that have been partially stripped may still lose a good deal of their sales value, Horner said. "It creates a wound in the tree, and they're doing it to the biggest and most valuable part of the tree." With profits at stake, timber producers throughout the Pacific Northwest have tried for years to combat the problem. Hammond Lumber experimented with a number of things in the 1950s to stop the bears -- including slaughtering 300 of them in one year, Able said. "A hew and cry went up" when word of the killings reached the public, and the company had to stop. It had achieved its goal; few trees were damaged in the next three years or so, Able said. But the victory was only temporary. "Within three to five years, it built right back up again." Timber companies may invite hunters onto their land during the fall bear season, but there's no guarantee that any bears killed were those doing the damage. Companies in Oregon and Washington reasoned that, if the bears had other food available to them, they might stay off the trees. To try a feeding program here, where the animals are more plentiful, might amount to "welfare for bears," Opalach of Green Diamond said. It might only make them dependent on the new food source and risk inflating the population. Or the alternative food provided might not be enough to make a difference for such a large number of bears. In any case, it's illegal in California to feed wildlife. Trees killed by bark-stripping bears. The tree at the right has been girdled. When he was assigned to tackle the bear problem in Hoopa, Mark Higley found that the tribe's special relationship to the animals demanded some creative thinking on his part. The Hupa people consider the bears their ancestors. "We can't just go out and kill them, because that's your grandma," said Lyle Marshall, tribal chairman. When Higley went before the tribe's Cultural Committee to explain the problem of the trees being stripped, he was met with a lot of questions. "They didn't want to just willy-nilly kill bears," Higley said. "They wanted to get a real handle on which were the problem bears -- at no small expense." So Higley and his staff, including HSU graduate student Jaime Sajecki [photo at right] , embarked on a painstaking two-year study to try to identify the bears that were doing the damage. They took hair samples from the stripped trees and sent them to a lab for identification. 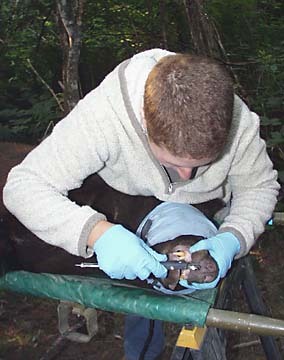 Then, they captured and anesthetized 240 bears and compared hair samples from them with the hair from the trees. The genetic tests turned up 78 "bad" bears. Of these, 25 were killed. "It looks like it's going to be valuable," Sajecki said. The tribe has spent about $400,000 on identifying problem bears, Higley estimated. It is also altering its basic forest practices -- which may turn out to be the most effective measure of all. "We've changed our management tremendously," Higley said. With no more clear cuts, and more of the older trees left intact, new trees will grow more slowly. The bears will be less likely to attack them. Dan Opalach [photo below right] remembers talking about forest pests when he was an undergraduate in the forestry department at HSU. Pests were things like fungus and insects. What he doesn't remember -- even through his master's and doctoral study -- is any discussion of tree-eating bears threatening timber. But as he took a visitor on a tour of the company's Crannell Tree Farm, a vast area just east of Clam Beach, it was clear that the problem was now impossible to miss. In some places, "if you look closely, you can see damage on every other tree," he said. "It's really amazing. "In this region right here [in Humboldt County], most of what gets damaged is redwood and Doug fir, sometimes red cedar," he continued. "Oregon says hemlocks will get hit." It's only in the last two years that Green Diamond has begun to do some serious analysis of the tree-stripping, Opalach said. The company has started by asking, among other things, why the bears are stripping the trees -- and why some trees and not others. "Sometimes they'll taste a redwood and they'll walk away, and other times they'll just strip the whole tree top to bottom," he said. "That's the other thing we need to learn: Why are some redwoods more tasty than others?" The fledgling research has led Opalach to do some things he never thought he'd do. One day, he was out in the woods with Lowell Diller, a wildlife biologist for the company. "We're looking at this redwood, and he pulls out a knife and he starts hacking away at it," Opalach said. "He said, `Taste it.' And I tasted it. And I thought, it's not so bad." The many cloned trees in the company's nursery may include one or more that the bears don't like, Opalach is hoping. But that finding is likely a long way off. And the company is nowhere near putting a dollar amount on the bear damage. "It's going to be extremely hard to quantify," Opalach said. 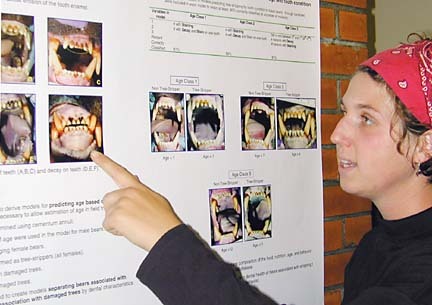 Palco is also studying the issue. "We know that there's a problem; we don't know how much of a problem it is yet," said Horner, the silviculturist. "The conventional way of dealing with any pests is to go out and kill the thing. But we want to understand more about what's going on there before we start to do anything about it." © Copyright 2004, North Coast Journal, Inc.